After being on a downward trend since the beginning of June, the European PP market has recently changed direction on the back of improved demand which boosted the sentiment last week, according to ChemOrbis. Players reported that many sellers implemented modest increases on their PP offers after conceding to three-digit decreases at the start of the month in line with the lower propylene contract settlements for October. Tighter PP supplies as well as firmer spot naphtha prices were also effective in the latest hike requests, according to players. Across the regional markets, the recent restarts of some PP plants are yet to affect supply levels for now while a force majeure decision came from LyondellBasell for their PP output from Aubette, France earlier this week. Market sources reported that the company’s 350,000 tons/year plant is expected to resume operations this week after being shut due to technical issues on October 6. 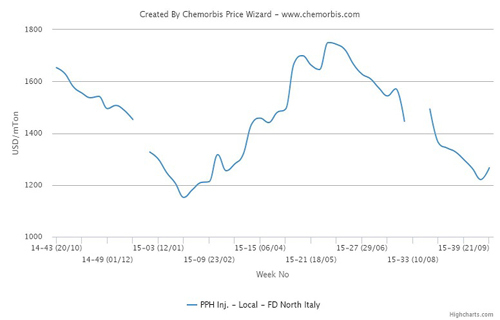 A compounder in Italy also reported receiving €30/ton increases this week when compared to initial October levels as per ChemOrbis pricing service. “Many sellers have already closed their order books and we only ordered material on a contractual basis from our regular West European supplier this month,” he added. Meanwhile, in Germany, a distributor reported that they raised their PP offers for West European origins by €50/ton compared to their initial October level, pointing to improved demand. PaintExpo 2016: How to fulfill stricter requirements with efficient coatings?